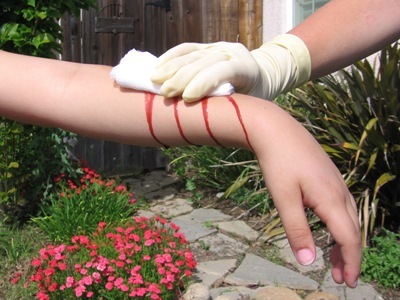 First aid for a bleeding victim is crucial. If you can slow or stop blood loss until the paramedics arrive, the patient's chances of surviving increase dramatically. Cover wound with sterile dressing or clean cloth, diaper, or sanitary napkin. Place your gloved hand over dressing, and press firmly. Continue pressure until bleeding stops. DO NOT remove dressing. If soaked through, add more material, and continue pressure. If no broken bone suspected, elevate wound higher than level of heart. DO NOT move limb if you think it is broken. if it does not appear broken. For wounds on arms, press on brachial artery: Use your fingers to apply pressure to inner side of victim's upper arm, between elbow and shoulder, in groove between muscles. For wounds on legs, press on femoral artery in groin: Use heel of hand to apply pressure at middle of crease where thigh meets groin. 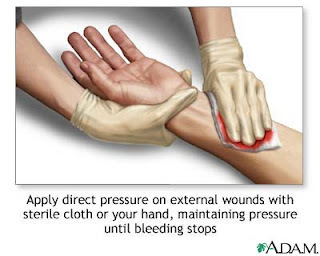 Release pressure point as soon as bleeding stops. Once bleeding is controlled, secure original dressings with bandage. To Recover Amputated Part: Wrap amputated part with dry gauze; DO NOT immerse in water or other liquid. Put wrapped appendage in sealed plastic bag or container. Place bag or container atop bed of ice -- DO NOT submerge. Send with victim, or transport immediately to emergency room. Keep victim lying down on their side or sitting up if more comfortable for victim, and cover lightly with blanket.